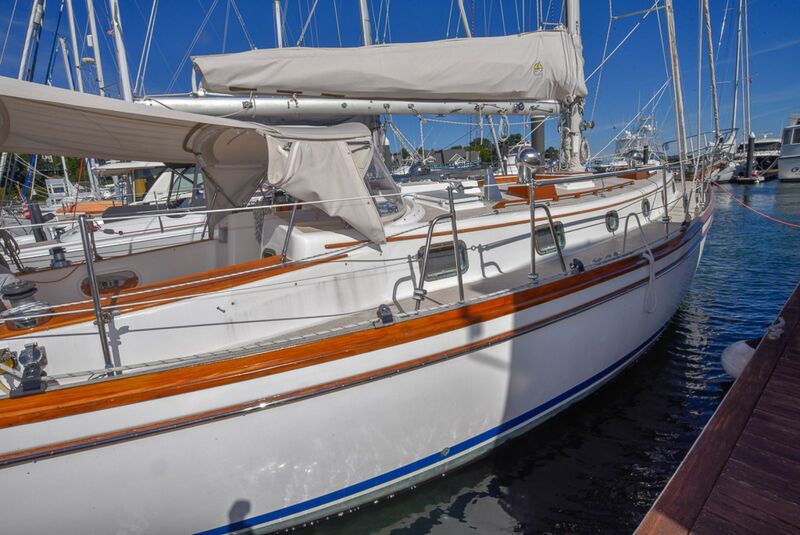 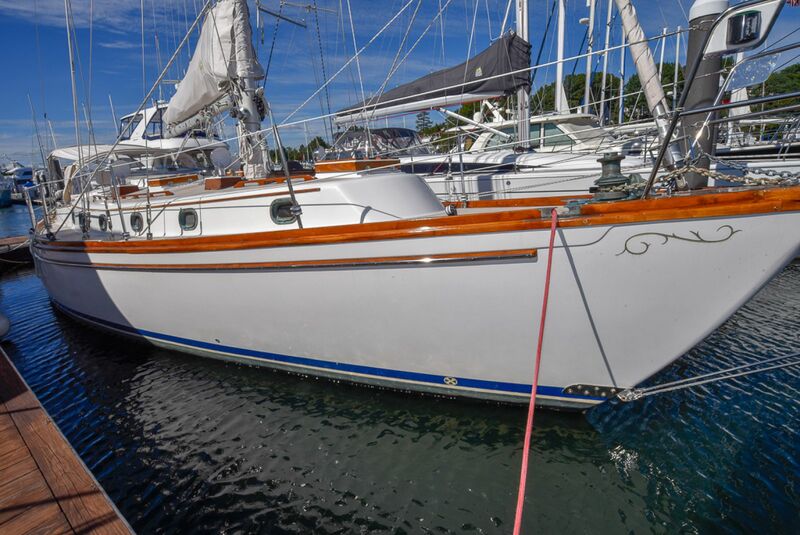 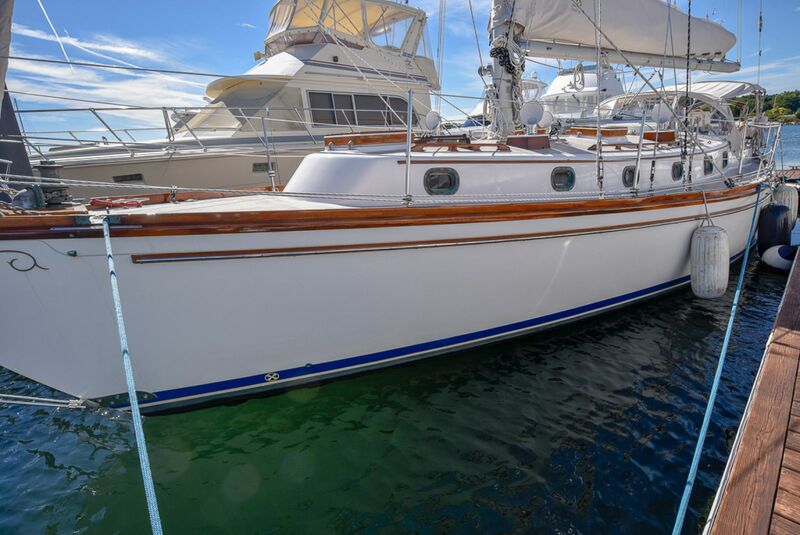 Nighthawk is a stunning example of the ever popular Shannon 43. 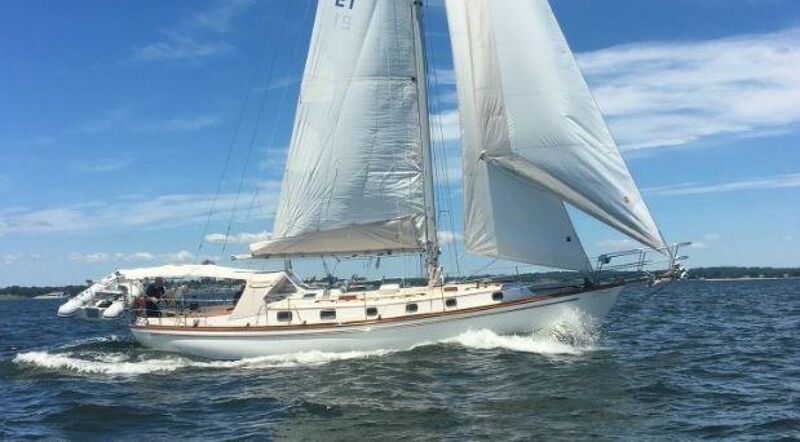 Well known as one of the world's best bluewater cruising yachts, Shannon has built an enthusiastic following, due to her timeless design, quality construction and attention to detail. 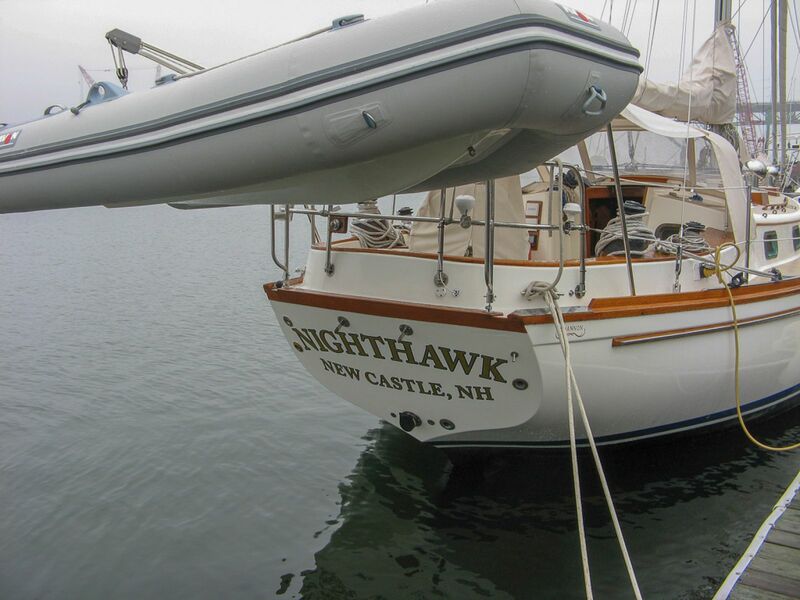 Nighthawk is nicely equipped with an easily handled but effective cutter rig and centerboard system all devised by Shannon. 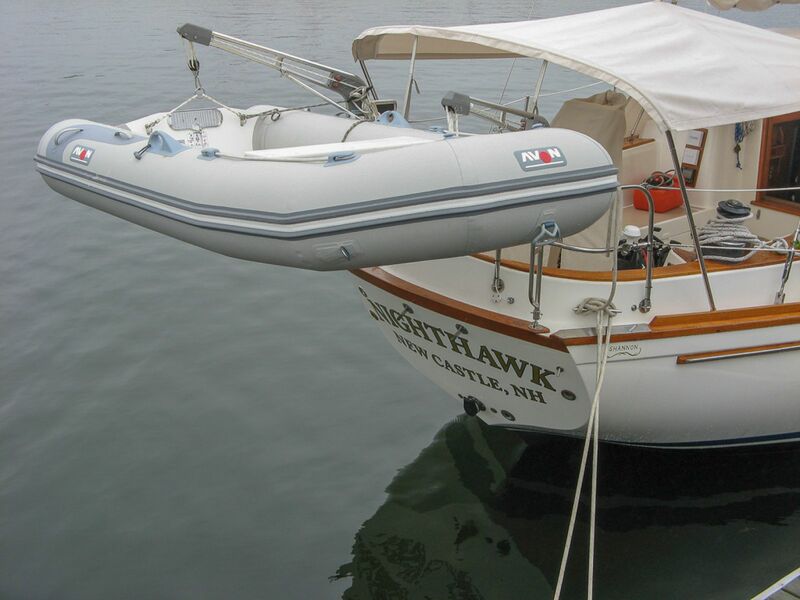 Safety while at sea was a major concern with the designers and thus the cockpit is deep with good backrests and the helm is with the reach of the sheet winches. 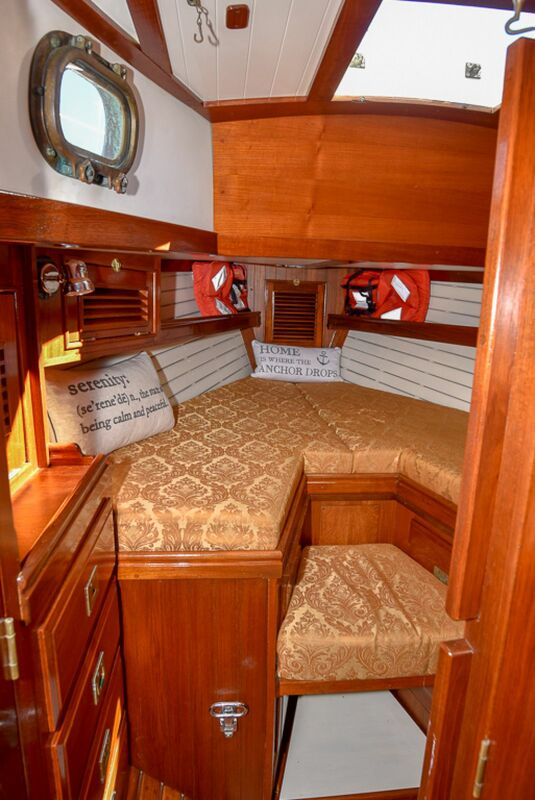 The interior has numerous handholds for safe maneuvering in a seaway. 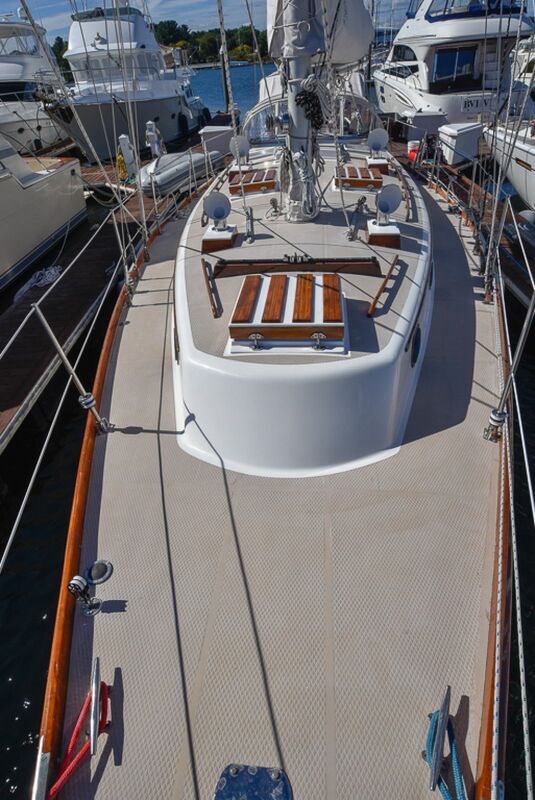 Nighthawk is located in Stuart, Florida and it would be my pleasure to show you this impressive yacht. 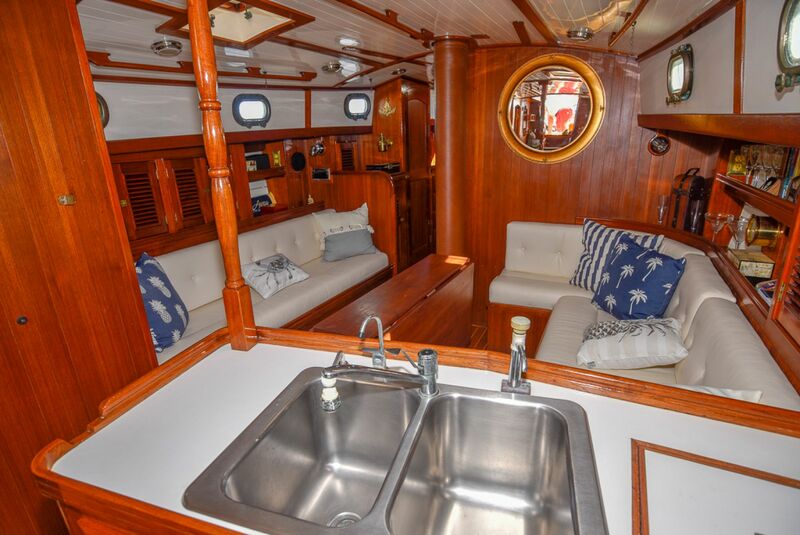 Nighthawk features a two stateroom, 2 head interior with teak joinery and a teak and holly sole. 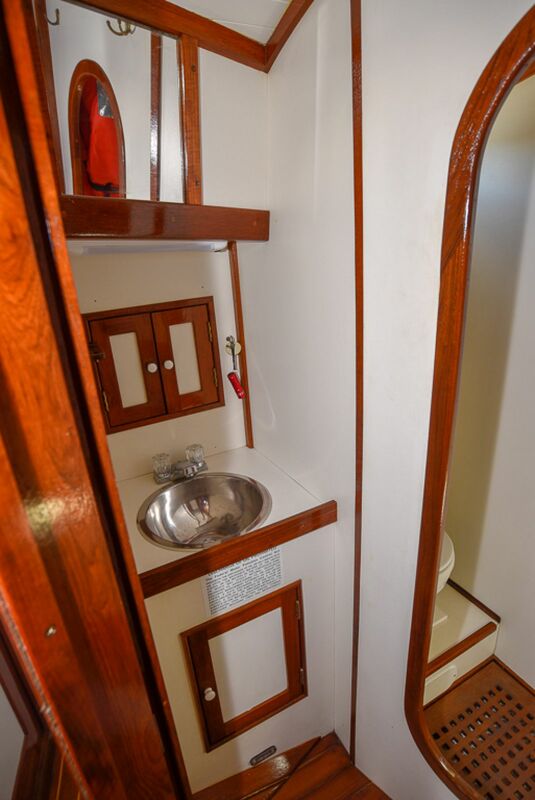 The forward cabin is separated from the main salon by a privacy door that leads to a comfortable "V" berth with an insert that makes it a double berth. 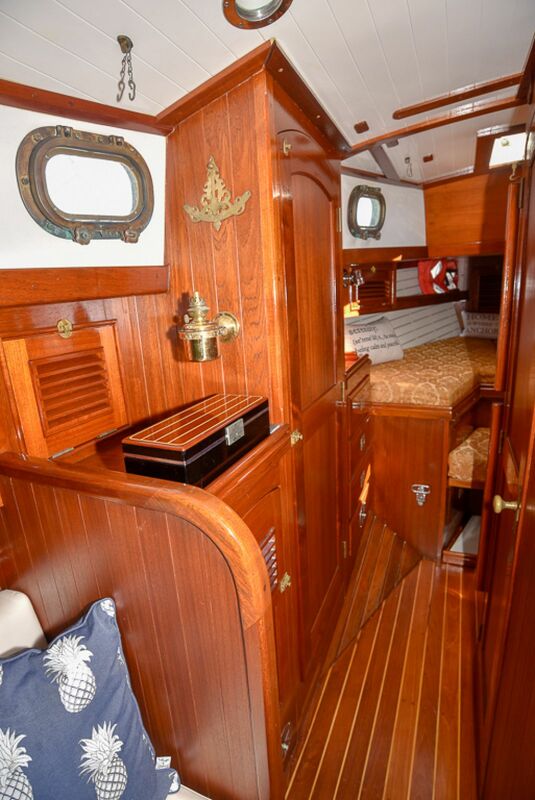 The cabin is done in a "Herreshoff" style. 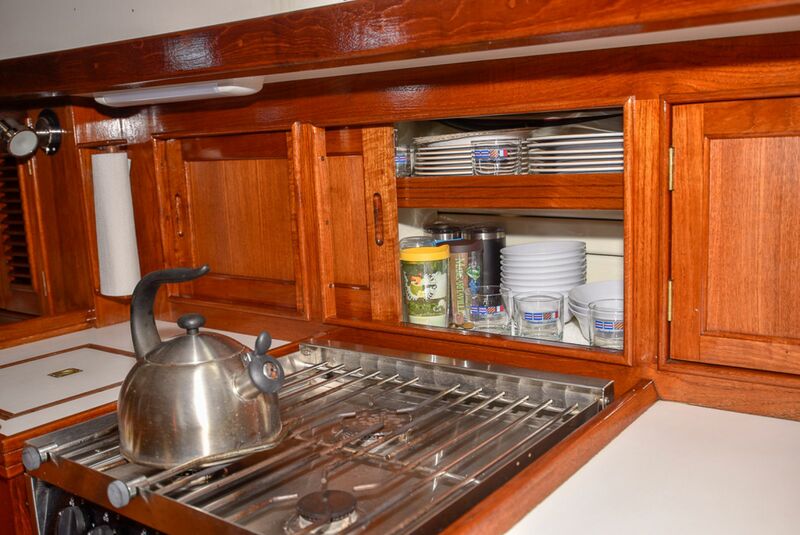 There are shelves to port and starboard with an opening locker at the aft end of the shelves. 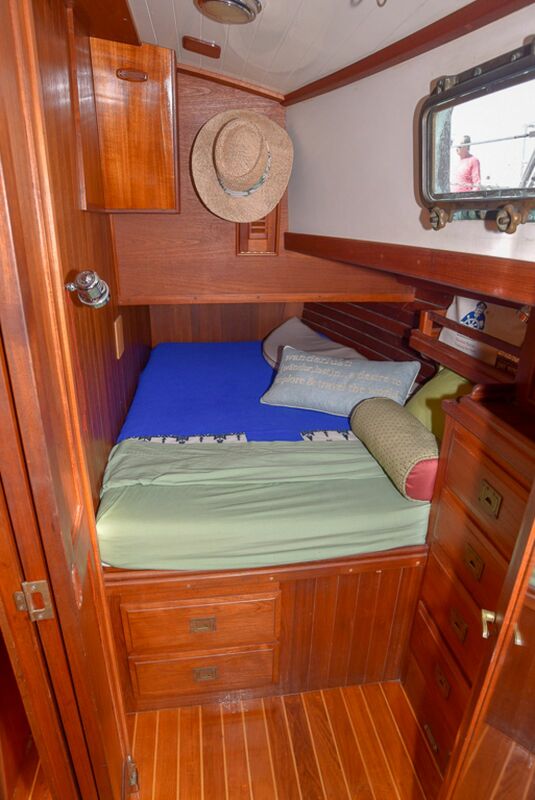 There are two pull out drawers beneath the bed. 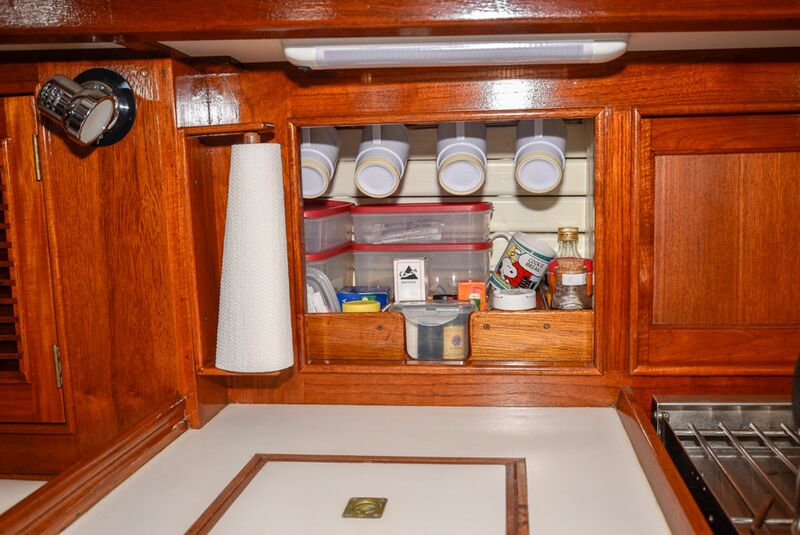 There are another two lockers for storage along with a set of three drawers. 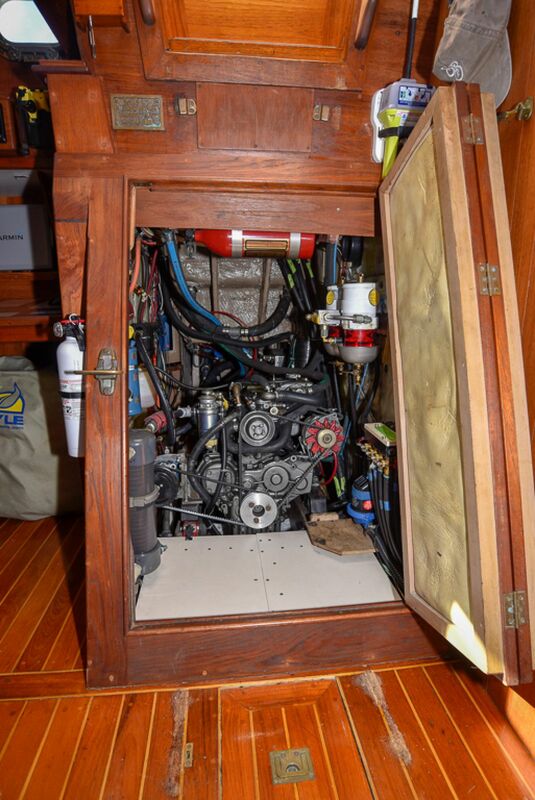 There is an opening hatch above and two opening port for light and ventilation. 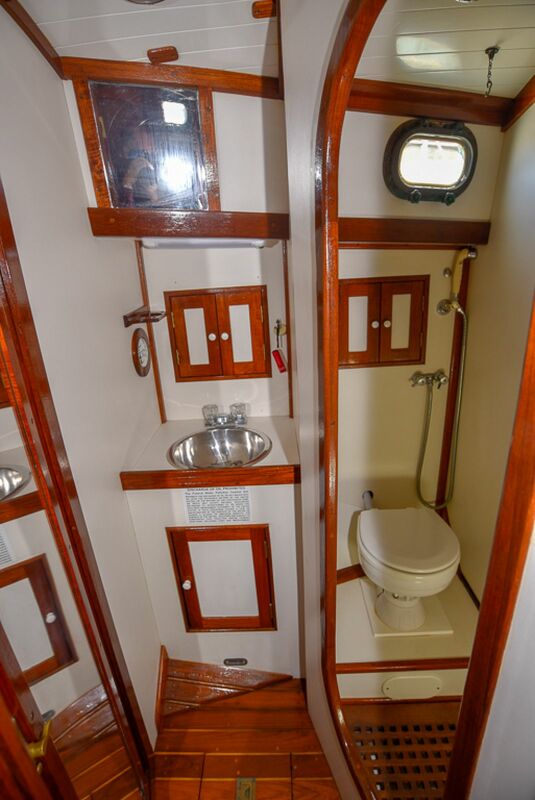 The head en-suite and has a marine toilet with holding tank, sink, vanity, cabinet, lockers, telephone shower and teak shower grate. 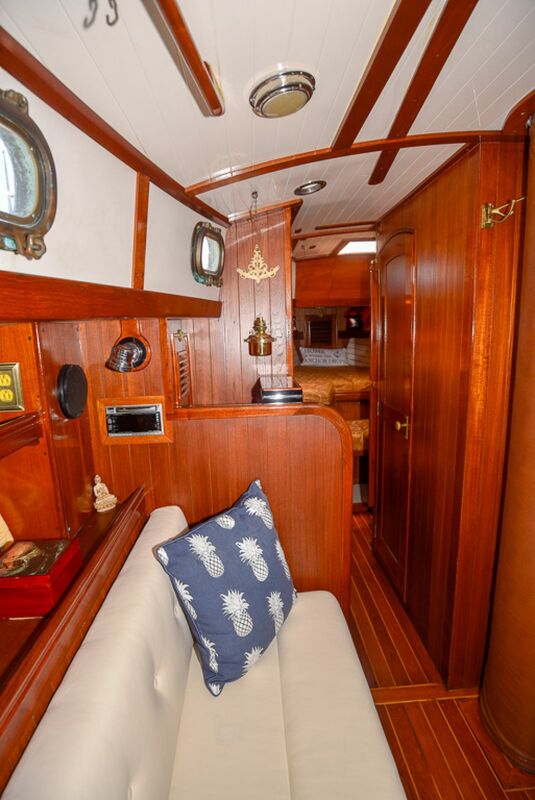 The salon is amidships and features an "L" shaped settee to starboard with a teak dining table and a long settee to port. 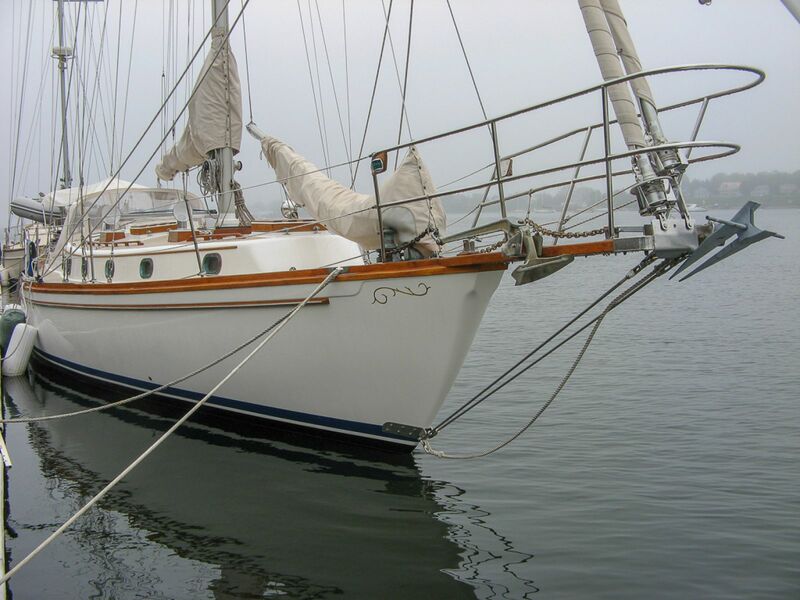 Both pull out to make single berths. 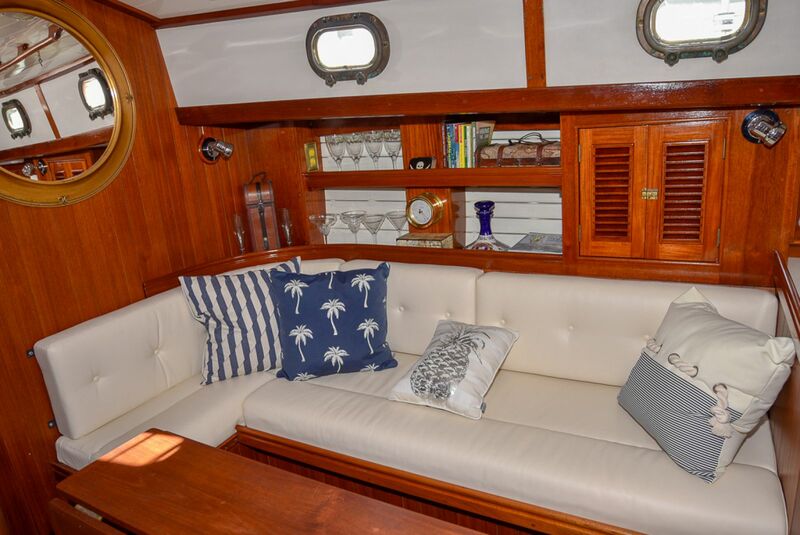 Above are bookshelves on each side and louvered cabinets for storage. 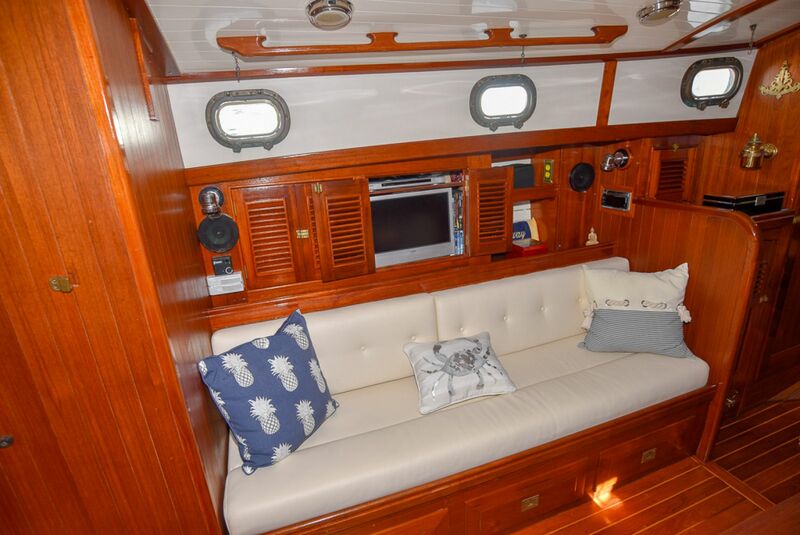 With the teak bulkheads, teak and holly sole plus high gloss headliner, a wonderful ambiance is created. 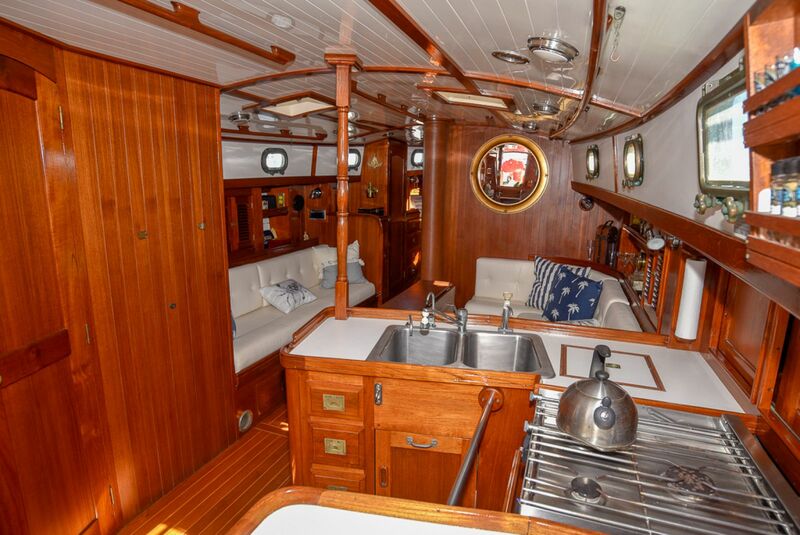 There are opening ports and hatches for ventilation and four chrome reading lights as well as ceiling lighting. 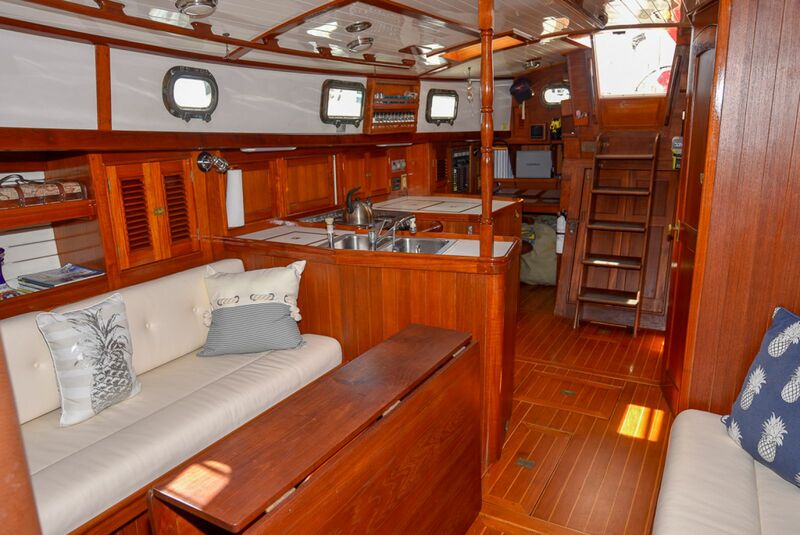 The main salon is very comfortable with leather upholstery and a large folding teak table that seats five. 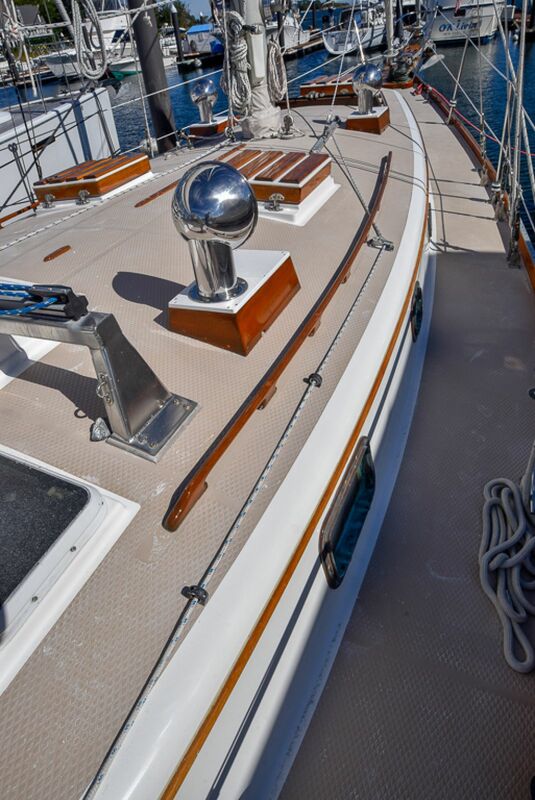 It is beautifully varnished and detailed and would please the most discriminating eye. 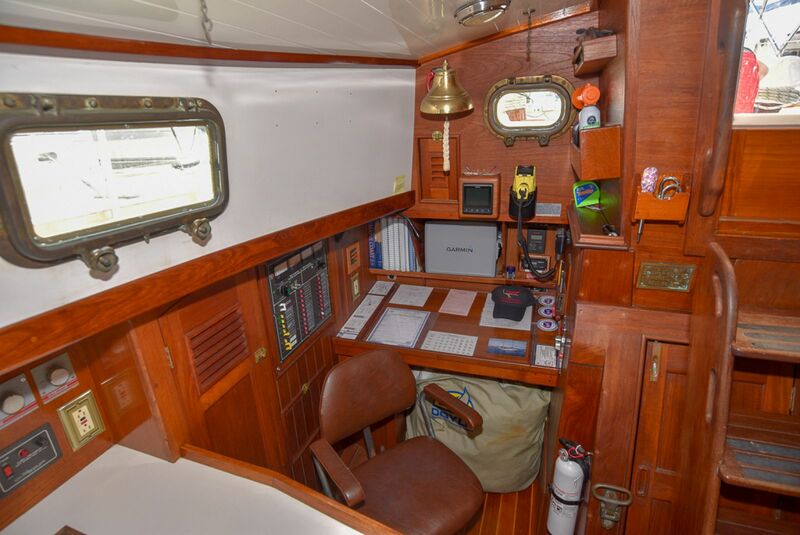 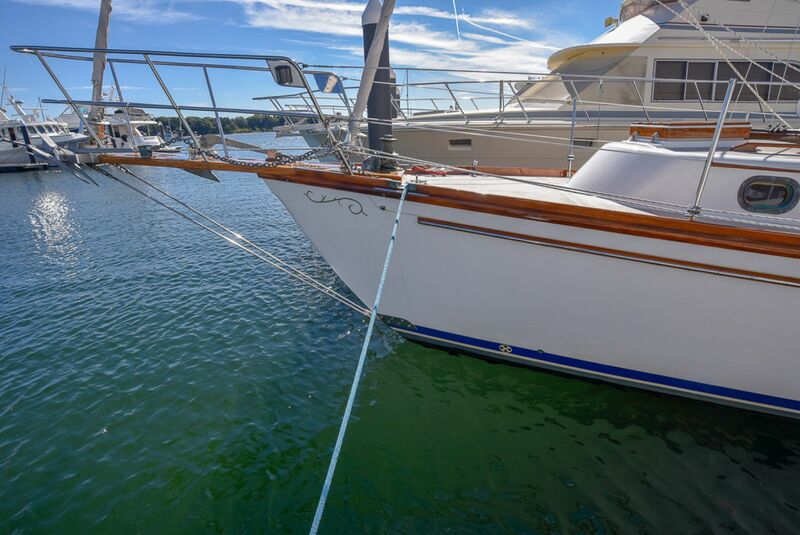 The navigation station is to starboard and features an opening chart table, electrical panels, along with a large Garmin touchscreen chart plotter. 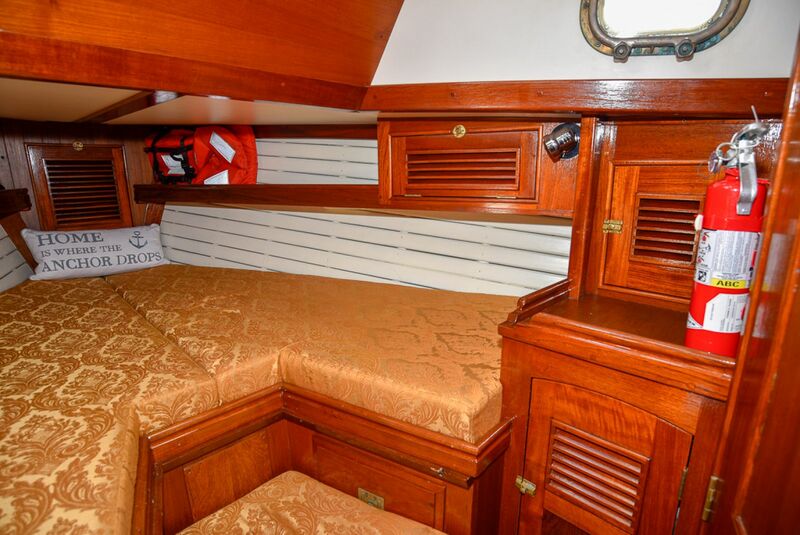 Across to port is the aft head with a private access door from the aft cabin. 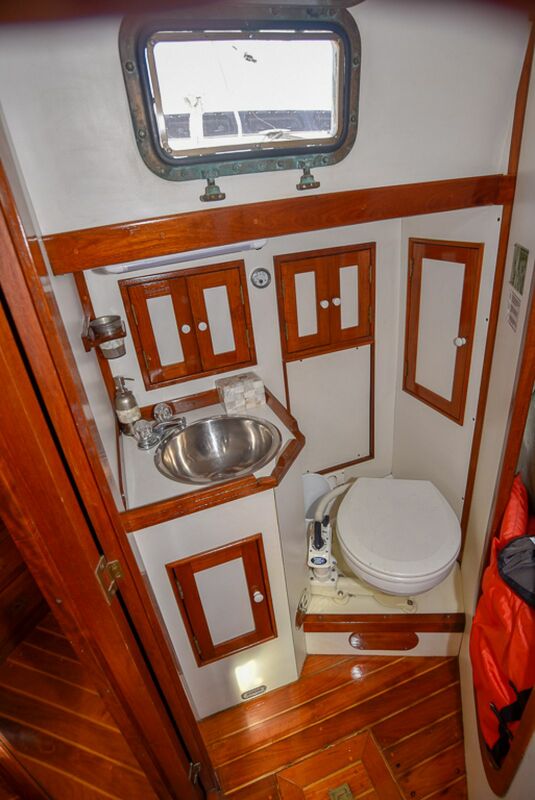 There is a marine toilet, vanity, mirror, and sink. 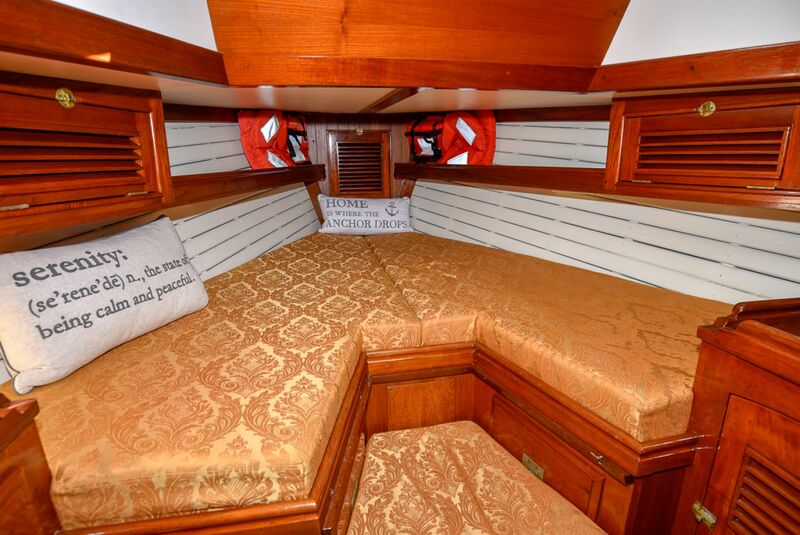 There is plenty of storage in numerous lockers. 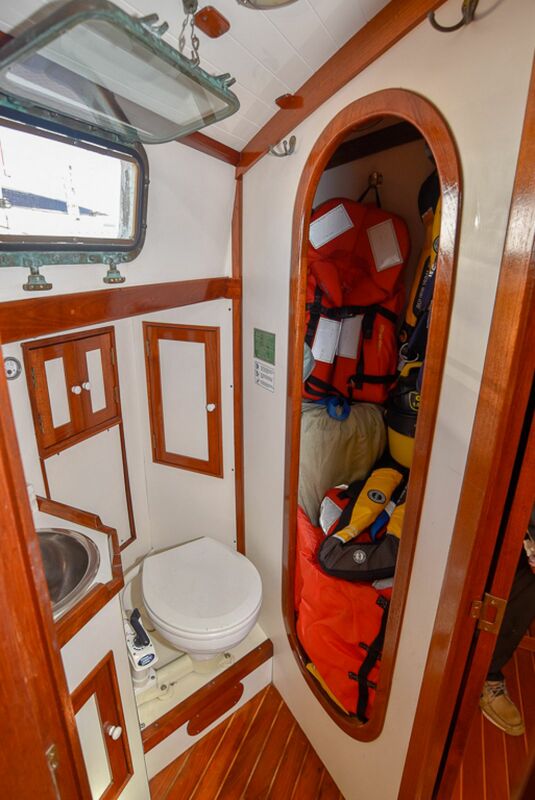 There is also an ensuite shower. 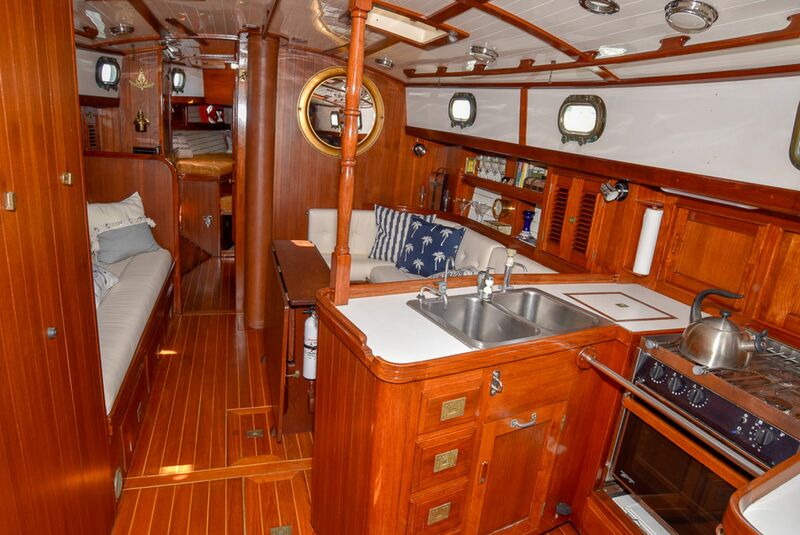 The aft cabin has a double berth with a sliding door for privacy, drawers underneath, a bureau with four drawers, a hanging locker and shelves to port. 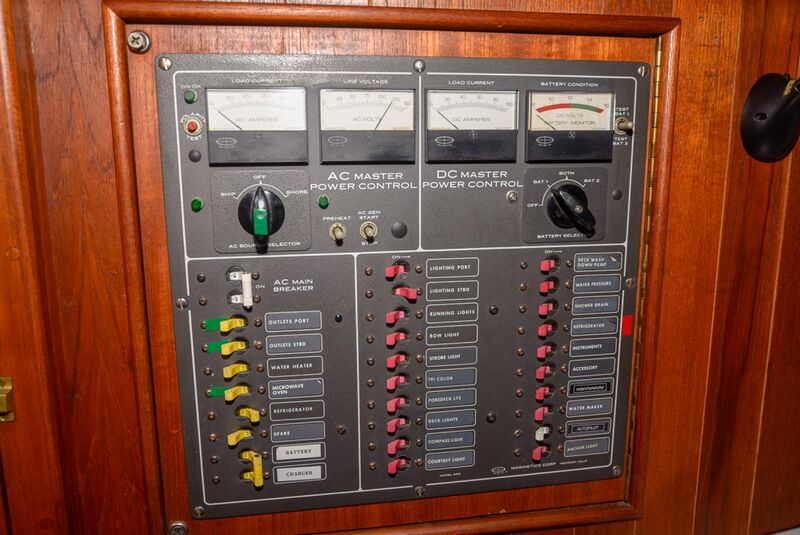 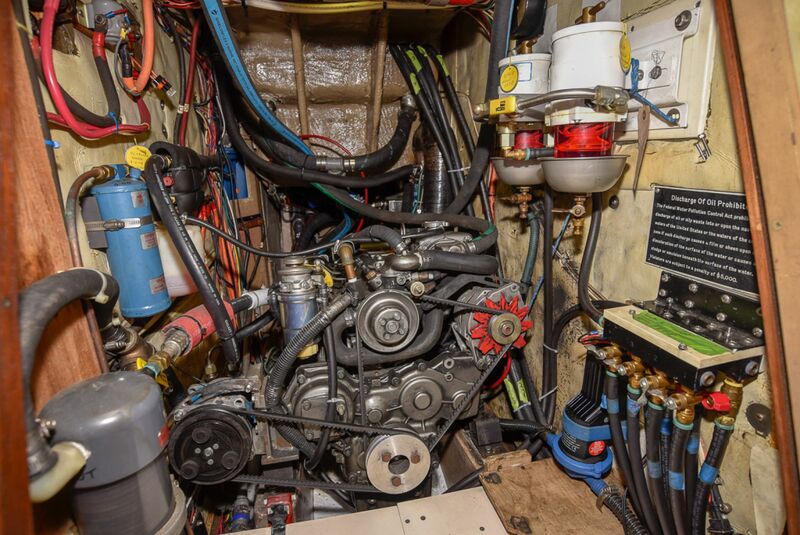 The entire boat is serviced by an Espar heating system. 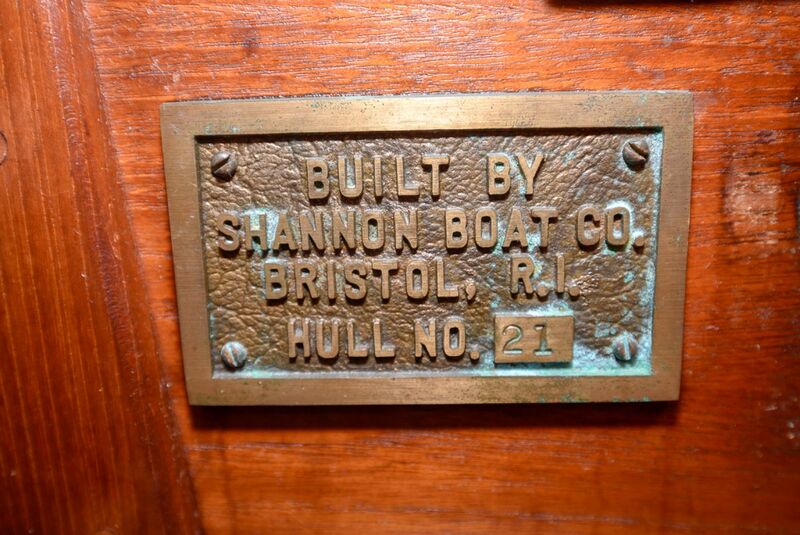 Shannon has long been known to build solid one piece hulls with no keelbolts. 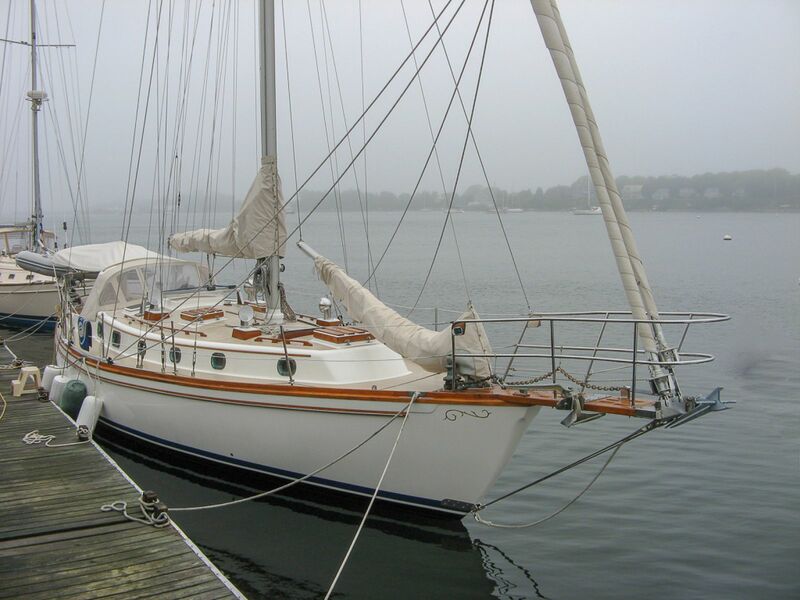 They have been using the best technology of the day to create a very strong and handsome classic yacht. 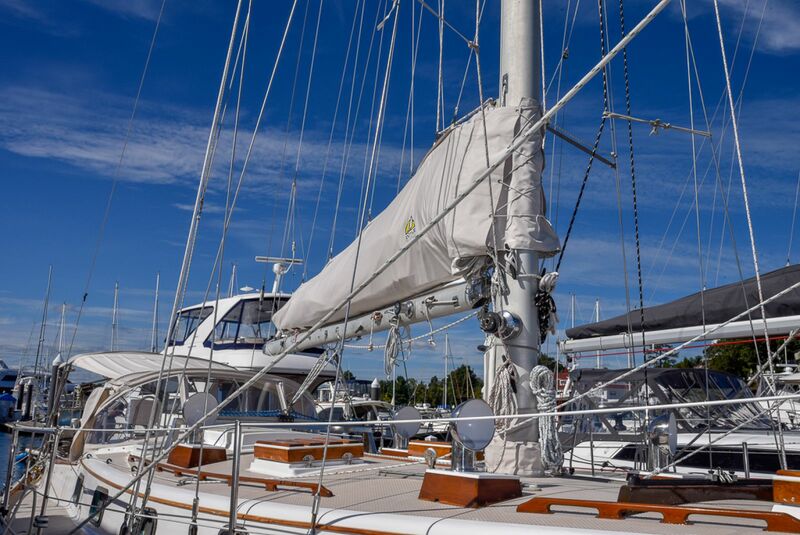 Over the years they have perfected the keel/centerboard design which allows for the ability to explore and anchor in shallower waters plus have a deep draft for offshore or windward work.